Time to get the paints out after the Christmas holidays! 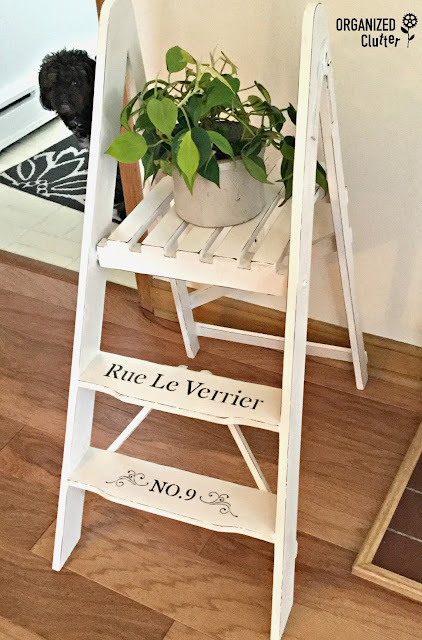 First up is this wooden step ladder style plant stand that I picked up at a garage sale last summer. It had a very dark espresso type stain. I painted the plant stand with two coats of Dutch Boy Chalky Paint in Antiquated Lace. I then distressed all the edges lightly with 220 grit sandpaper. The French street stencil is from Decoart. I stenciled the letters and number with black craft paint. Then I brushed on a coat of water based Varathane poly sealer in matte finish. I love how my little plant stand turned out! I love how a little paint and a French stencil can transform a piece of furniture. My dog, Fergie, isn't sure what to make of ANOTHER different thing in the living room. That turned out so pretty, Carlene...and I love Fergie's photobomb! The step ladder planter turned out really nice. Makes a pretty plant stand! 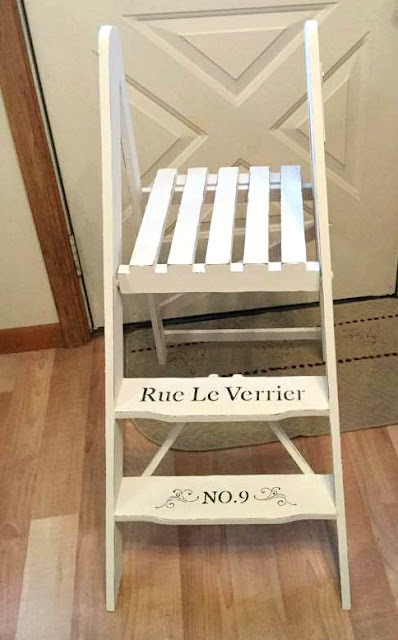 I see lots of neat things made from old step ladders, but can't ever get my hands on one for myself. Nice redo! Our pets are forever "helping", aren't they. I've been taking some photos of my room project, and darn it if I don't have lots of furry critters who seem to think I need them! Oh, well...you gotta love them. That is so cute! I've never seen one quite like that and it looks a hundred times better painted white. I want one just like it! I got attracted by the title of your blog - organized clutter - actually two opposite concepts. In your hands, however, it becomes one strong concept. That is so cute and makes the perfect plant stand being that it doesn't have a top step. Know what you mean about another thing in the living room too. We have that problem.